O Lord my God, great, awesome and glorious Creator of all things visible and invisible; You Who faithfully keep Your Covenant and Your mercy with those who love You and observe Your Commandments; I thank You now and always for all the visible and invisible blessing which You have bestowed upon me. I praise, glorify and magnify You, up to the present time, for in accepting me from my mother's womb and providing for me out of Your abundant goodness and love for mankind, You have providentially protected and guided me in a Holy manner, and thus Your rich mercy and compassion has been wonderfully demonstrated in me throughout my life. You did not overlook my lowliness because of my unworthiness and sinfulness, nor did You cease to help me and provide for me because of Your loving kindness and compassion. Do not forsake me then, O my God, even until my advanced and old age. O Jesus Christ, the good Name above all names, my sweetness, my longing and my hope, You became man for us and in wisdom planned and assigned everything for our salvation. With all my heart, O Lord my God, I confess to You. I bow down upon the knees of my body and soul and recount before You, my God, all my sins. May I hope that You too will incline Your ear to my supplication and will forgive the irreverence of my heart. Amen. On October 27th Our Holy Orthodox Christian Church commemorates, honors and entreats the holy intercessions of the following Saints, Forefathers, Fathers, Patriarchs, Prophets, Apostles, Preachers, Evangelists, Martyrs, Confessors, Ascetics, and Teachers of Our Holy Orthodox Christian faith: Saint Nestor of Thessaloniki; Saint Mark of the isle of Thasos; Saint Cyriakos, Patriarch of Constantinople; Saint Alexander, bishop of Guria. 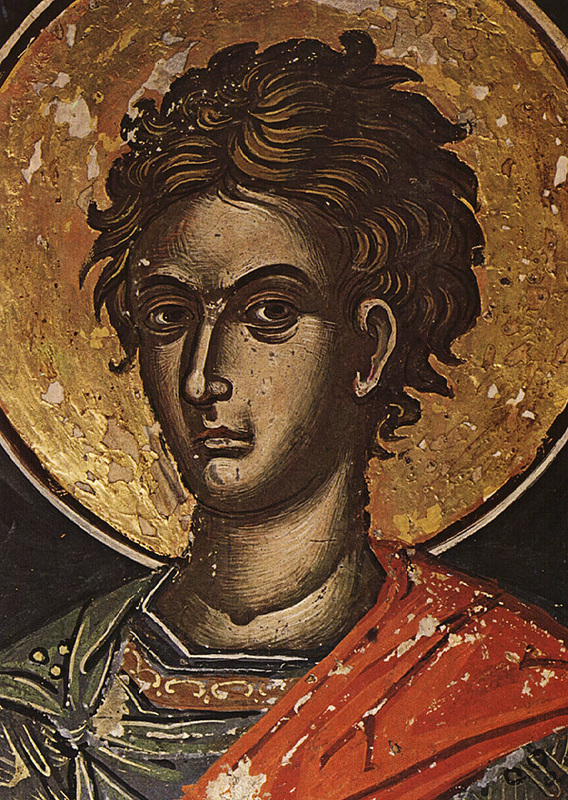 THE HOLY MARTYR NESTOR. At the time of the martyrdom of Saint Demetrios the Outpourer of Myrrh, there was in Constantinople a young man, Nestor, who had learned the Christian faith from Saint Demetrios himself. At that time, the pagan Roman Emperor Maximian, an enemy of Christ, ordered various games and amusements for the people. The Emperor's favorite was a Vandal called Lyaeus, a man of Goliath-like size and strength. As the imperial gladiator, Lyaeus challenged men every day to a duel and slew them, and this blood-letting of his delighted the blood-lust of the idolatrous Emperor. He built a special arena, like a terrace on pillars, for Lyaeus's duels. Underneath this terrace were planted spears with sharp cutting-edges pointing upwards. When Lyaeus had overcome someone in the duel, he would push him from the terrace above onto the whole forest of prepared spears below. The pagans stood around with their Emperor, and were delighted when some poor wretch writhed in torment on the spears until he died. Among Lyaeus's innocent victims were a large number of Christians, for, when there was a day when no-one came forward voluntarily to duel with Lyaeus, then, by the Emperor's orders, Christians were compelled to fight with him. Seeing this horrifying enjoyment of the pagan world, Nestor's heart swelled with pain and he resolved to go himself to the arena of the gigantic Lyaeus. He first went to the prison where Saint Demetrios blessed him, signed him with the sign of the Cross on forehead and breast, and said to him: "You will overcome him, but you will suffer for Christ." The young Saint Nestor then went to Lyaeus's arena. The Emperor was there with a large crowd, and they all bewailed the probable death of the young St. Nestor, trying to dissuade him from fighting Lyaeus, but the holy martyr Nestor crossed himself and said: "O God of Demetrios, help me!" With God's help, Saint Nestor overcame Lyaeus, felled him and threw him down onto the sharp spears, where the heavy giant soon found death. Then the whole people shouted: "Great is the God of Demetrios!" But the Emperor has lost face before the people, and mourning his favorite, became filled with anger against Saint Nestor and Saint Demetrios, and the evil Emperor ordered that St. Nestor be beheaded with the sword and Saint Demetrios run through with spears. Thus the glorious Christian hero, St. Nestor, left behind his young earthly life in 306 AD., and entered into the Kingdom of his Lord. "According to tradition, it was Christ, who re-named both his Disciples and various others in the New Testament (St. Mary Magdalene, for example). Christians were also exhorted to take the names of Prophets and Saints by the authors of the first Catechetical texts of the primitive Church. It was also at this time that Liturgies were universally celebrated in honor of the Martyrs, Apostles, and Saints, when those having their names would commemorate them. According to tradition, then, the commemoration of the names of holy persons, including the Mother of God, is Apostolic (hence the origins of the Service of the Elevation of the Panaghia). It is a wholly Western idea that the celebration of Name Days is anything but an Apostolic practice. It grew out of the veneration of Martyrs and Saints and was a natural, organic part of the commemoration of Baptism. Consulting Western historical texts, instead of Orthodox Patristic tradition, will do little to clarify this practice and shows rather a deficit in how to approach our Church's tradition." "...In the ancient Church, the Church of the first centuries of Christianity,...when the catechumens had been taught all that they were to learn, their instructor would take them back to the Bishop, and the Bishop would recommend that they change their pagan names and adopt Christian ones; these names were to remind them of the holy personages or virtues (e.g. Agapios, from agape, "love"...)." Saint Ev (u)stathios, whose pagan names was Placidas, was given the name "Evstathios" in Holy Baptism. He was martyred in 100 A.D. and his Baptism took place sometime in the 8os. His wife (Theopiste) was also given a Christian name, as were their two sons (Agapios and Theopistos). This life was compiled in the 11th century by Saint Symeon Metaphrastes. In Eusebius', early 4th century Ekklesiastike Historia, we find reference to the Christian practice of giving the names of the Apostles to children. Also in the same work, we read that the Egyptian Christians forsook their pagans names for Scriptural names--usually the names of Prophets (Book VIII, "The Martyrs of Palestine"). In his "Homilia enkomiastike eis ton en Hagiois Patera hemon Meletion...", Saint John Chrysostom tells us that many Christians named their children after this great Saint (Patrologia Graeca, Vol. I). Saint Prokopios of Gaza, writing in the early 6th century and speaking of the early (pre-Constantinian) Christian Martyrs, states that many of them took the names of "holy men" (Saints) for themselves. "With these names, they eagerly delivered themselves to martyrdom," he writes. This may seem inapplicable to the question at hand, but martyrdom in the Orthodox Church, at least, is considered "baptism by blood." It is not unusual, then, that the Martyrs chose to take the names of Saints. With regard to the celebration of the onomasterion (onomastike heorte), here again we must turn to the double witness of history and Holy Tradition. It is clear that Christians celebrated the Divine Liturgy in Apostolic times in memory of the Martyrs and Saints. Saint Polycarp, for example, was martyred on February 23, 155/6. The Christians in Smyrna issued a letter, To Martyrion tou Polykarpou, in which they exhorted other Christians to celebrate the day of his Martyrdom and expressed their desire that the Lord "will permit us" (future tense) to gather in joy to continue such a celebration. That this practice of calling on the memories of the Saints in liturgical rites is, again, a complex one, we do not argue. Holy Tradition has always associated it with the earliest Christian liturgies. And certainly there is clear evidence by the 2nd century of such a tradition. Holy Tradition also establishes that these celebrations were honored by those who bore the names of the Martyrs and Saints who were being commemorated. In his Pneumatike kai Theologike Historia (Bucharest, 1878), Ioannes Eletes points out, on the basis of not a little data, that "...spiritual tradition and countless anecdotal materials from the lives of the Saints therefore give evidence of the age-old commemoration of holy personages, beginning with the commemoration of the Theotokos herself by the Apostles commemorated in the services by the Great Martyrs and Saints of our Church." "With the progressive de-Christianization of society, the use of the expression "Christian name" is becoming less and less common and is being replaced by "first name" or "forename." Not so long ago, Roman Catholic always gave their children Saints' names. Even Protestants used to give their children those names that appeared in the Holy Bible (Old Testament) i.e., Jonathan, David, Jeremy, Ruth, Judith, Esther, Rebecca, Rachel, Deborah, Abigail, Sara, etc. were all once popular names in Protestant-based societies. Nowadays, it seems that Orthodox Christians are the only ones to keep the tradition of giving their children Saints' names. But many questions are posed as to what exactly a Christian name is and what names those entering the Orthodox Church should take." First of all, it is necessary to point out that someone entering the Orthodox Church should not take a new name if he/she has one that is already born by a Saint in the Church calendar. Another question which sometimes arises is whether a person with a female form of a male Saints' name, for example, Nicole, should be able to keep it. In Greek practice it is quite common among laity. There is also the question of how parents should name their children. The tradition was to look in the calendar either on the day of birth, or on the eight day at the naming ceremony, or else on the fortieth day after the birth. These are pious traditions which future parents should bear in mind. The Christian name given to a newly baptized person is the name of the Saint who will be that person's patron Saint throughout his life. The Orthodox Christian acquires an identity akin to that of the Saints whose name he/she bears...According to Orthodox tradition beginning with the early Church practice the Christians celebrated the feast-day of the Saint on his/her martyrdom and the beginning of their life in the Kingdom of God. If you find yourself Orthodox and without a Patron Saint pray to God, and ask Him to show you who your Patron Saint should be. As that the Saint himself or herself choose you! Meditate and seek to discern if a love for a particular Saint has been born in you already by the Holy Spirit. "Pray unto God for me, O Holy (name of Saint), well-pleasing to God: for I turn unto you, who are the speedy helper and intercessor for my soul." [A Personal Note:] Please make every effort as Orthodox Christian parents to inform your child of his/her Christian Baptismal name and who his/ her Patron Saint is. Also when the feast-day of the Saint is. Read to him/her the life of the Saint whose name your child bears Teach them to emulate their virtues and holy lives as young Christians. The Saint is the ideal role model for your child, not a rock star or a Hollywood celebrity.